This book provides 3rd through 12th grade teachers with more than 50 teacher-tested tools and techniques for helping their students read independently and critically. 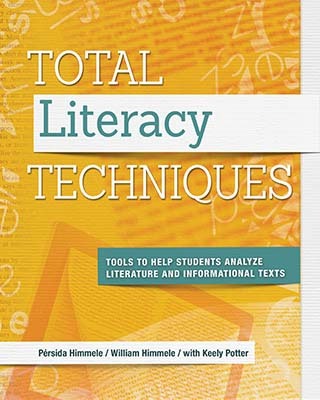 Authors Pérsida and William Himmele and National Board-certified teacher Keely Potter present literacy as an interconnected process that involves emotions, cognition, and multiple opportunities for developing higher-order thinking. With this in mind, they present tools for helping students develop academic language, become avid and analytical readers, engage with literature and informational texts, discuss texts, and write about texts in clear and cogent ways. Each chapter includes reflections from real teachers and students who share their own literary practices and journeys, bringing the practices to life. With a focus on engaging students as thinkers, readers and writers, Total Literacy Techniques provides practical and effective ways for teachers to help students develop the critical reading habits that open up new ways of understanding and contributing to their worlds. Pérsida and William Himmele are the authors of the best-selling ASCD book Total Participation Techniques: Making Every Student an Active Learner. "Through the use of the proven tools and techniques shared throughout this text, practitioners will have a strong source for "helping students comprehend, analyze, discuss, and create text that enhances students’ growth as reflective learners." This book will surely help teachers in their effort to engage their students in both reading and writing." PERSIDA HIMMELE is an Associate Professor at Millersville University in southeastern Pennsylvania. She has served as an elementary and middle school teacher, a district administrator, an English language learner program consultant, and a public speaker on issues related to student engagement and teaching in diverse classrooms. She has lived, taught, and studied in New York, California, and Pennsylvania, becoming actively involved in advocating for the passage of educational policies and funding formulas for the betterment of urban schools and English language learners. She earned her Ph.D. in Intercultural Education from Biola University and her Masters in Elementary and Bilingual Education from SUNY Buffalo. In addition to several articles, she and her husband, William, are the authors of the ASCD bestseller Total Participation Techniques: Making every student an active learner and The Language-Rich Classroom: A research-based framework for teaching English language learners. WILLIAM HIMMELE is an Associate Professor at Millersville University in southeastern Pennsylvania. He has served as an ESL teacher and a Speech Pathologist, a higher education administrator, an international consultant and a speaker on issues related to increasing student engagement and teaching English language learners. He served as the coordinator for the graduate ESL teacher certification program at Millersville University and has been an educational program consultant for several schools in various countries seeking to improve their school programs. He has lived, taught and studied in New York, California, and Pennsylvania. He earned his Ph.D. in Intercultural Education and his Masters in Teaching English to Speakers of Other Languages (TESOL) from Biola University. KEELY POTTER is a National Board Certified Teacher who currently teaches Language Arts to 5th through 8th graders at Dodson Branch School in Jackson County, Tenn. Half of her time is spent in the role of master teacher, which allows her to work with teachers in an instructional coach setting. Prior to teaching in her current rural district, Potter was a teacher, a literacy coach, and a reading specialist. She has also served as a professional developer and as a literacy consultant—which she continues to do. Most of her 21 years of teaching experiences have been in an urban setting, where we observed her weaving the same literary magic that she now currently performs in a rural setting.